It certainly wasn’t very springlike on May 2, when it snowed. The snow melted practically as fast as it landed, but that was probably because I threatened it with a welding torch. 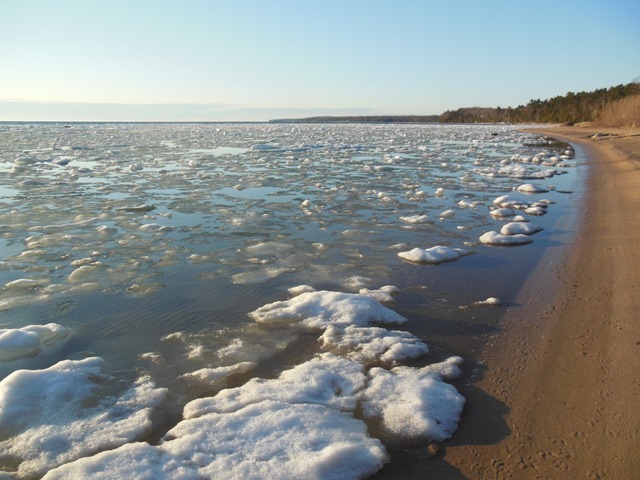 It wasn’t very springlike on May 5, when plenty of ice bobbed about in the Bay. It wasn’t even our ice. It was the ice from the Straits of Mackinac that had finally broken up and drifted onto Lake Michigan . . . where a north wind caught it and delivered it to Grand Traverse Bay. However. You will notice the sunshine. 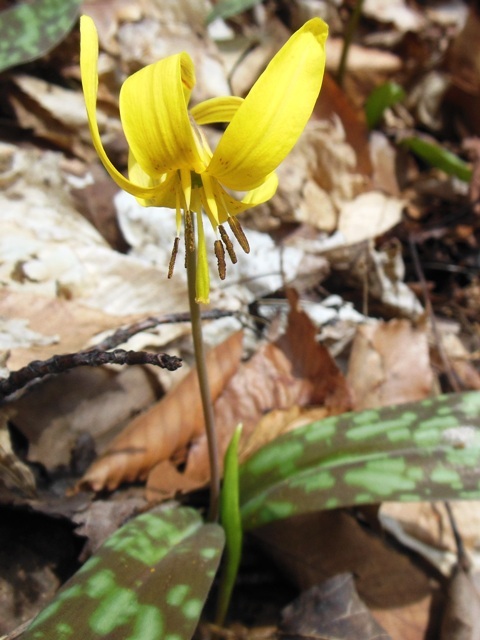 The last of the ice melted and things really started looking up in the next week when we found trout lilies and Dutchmen’s Breeches in bloom. 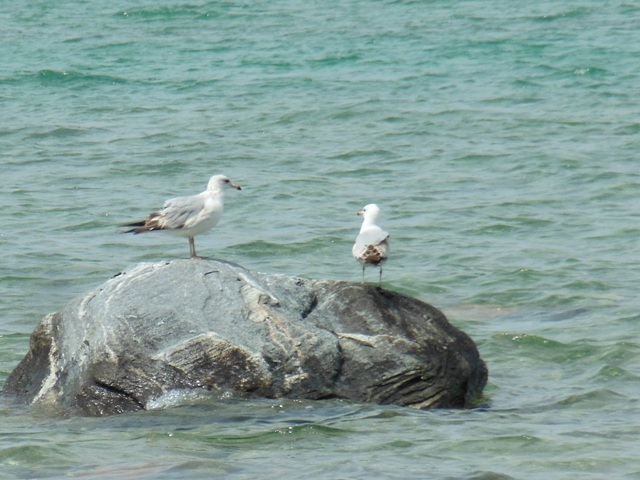 The gulls were in a good mood . . . for gulls. Finally, on May 18 real spring arrived. It was deliciously warm. It smelled good. There was more sunshine. 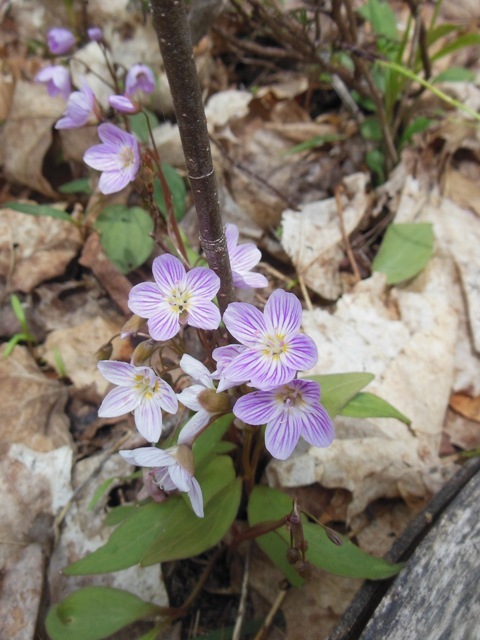 Spring Beauty (Claytonia) opened along our favorite woods path. 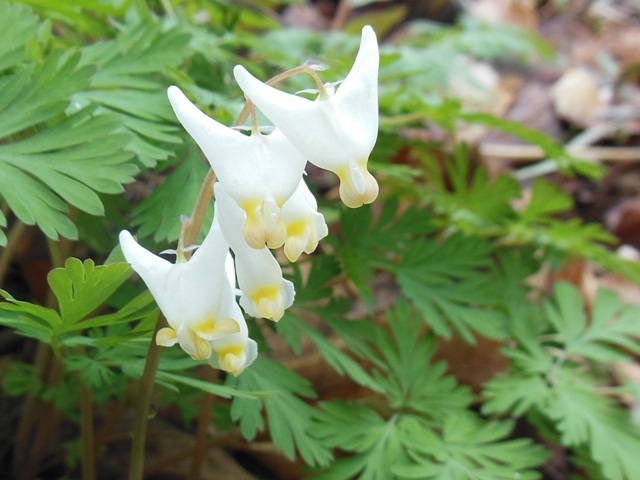 These tiny flowers grow on delicate stems, but they’re very brave, pushing through the leaf litter even before the last of the snow is gone from the shady places. Apparently there are several different kinds of Claytonia, but I can’t tell them apart and they seem to intermingle a good deal anyway. I suspect they are developing whole new varieties just for fun. Trillium grandiflora bloomed in open woodlands and along the roadside – drifts of them all over Antrim County. You’d never guess that the abundant trillium is a protected wildflower, but if it weren’t we wouldn’t have it anymore, so don’t pick it, OK? 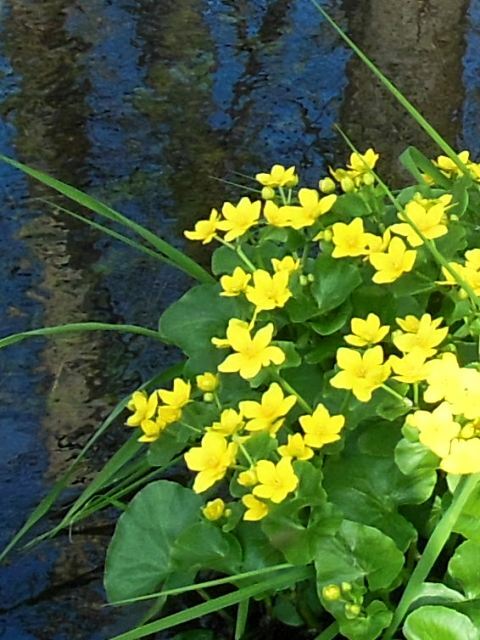 The wetlands north of Elk Rapids were brilliant with marsh marigolds – which my grandmother taught me to call cowslips, and so I do, to this very day. At dusk I took Miss Sadie and the Cowboy for their third walk of the day. 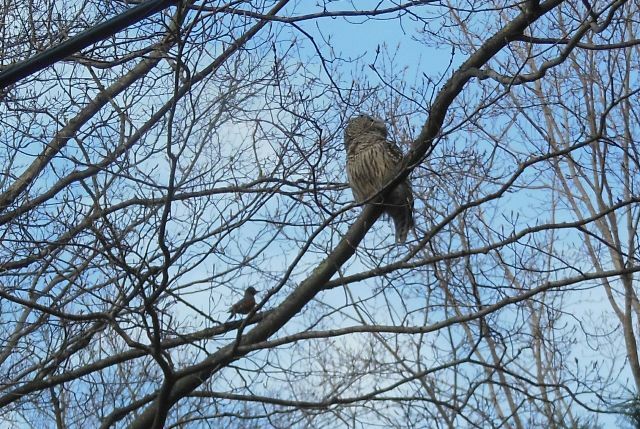 We heard a couple of robins giving a barred owl a good talking to, and watched the ruckus in the tree across the road. The owl was offended, and took off for its favorite perch in the woods behind the Writing Studio and Bait Shop, where it spent much of the night hooting at us. Real springtime, it turns out, is a noisy time. 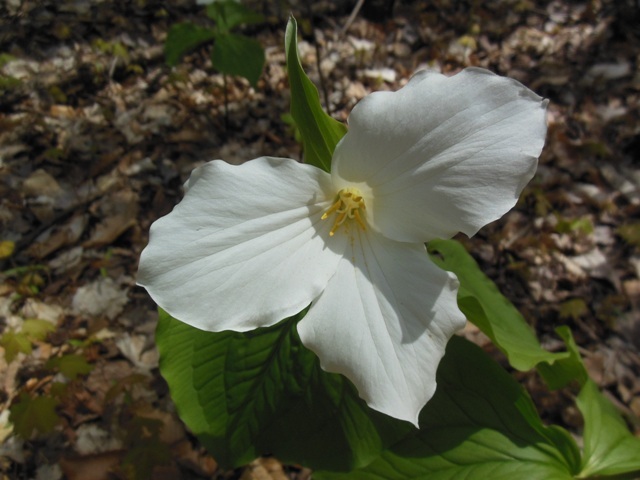 The trillium were glorious….and so appreciated after that season that shall not be named. That nameless season that has . . . withdrawn, but not in any way conceded defeat. Pretty pictures. It’s a good thing that big lake ice melted. It’s time to move from spring into summer. One of the monitor buoys in the bay reports a water temperature of 62. Quite a contrast to the big lake where a buoy indicates a temperature of 36.near the Manitous. Thank you. As for the water temp . . . I’ve been down there with the dogs every day this week and it is COLD. The wind is cold, too – although of course all of it is so much warmer than it was not so long ago that I am really happy. Thank you. 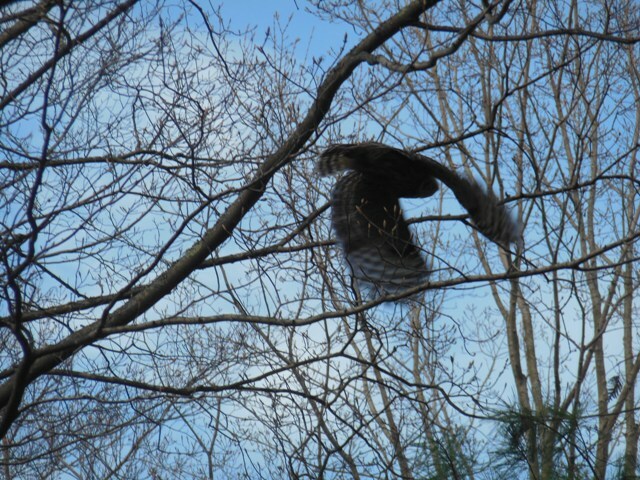 Watch for more Barred Owl photos. I haven’t captured the pileated woodpecker yet, but have hopes. I’ve seen a red shouldered hawk in the misty dawn, and have hardly any hope of catching that one. All these birds make for interesting walks, though, eh? This is a wonderful post, Gerry. Even the ice is beautiful, but of course we’re more in the mood for flowers, aren’t we? As for the owl — WOW. Thank you PJ. I’m glad you liked the owl. A week or two later I found the rascal in the morning. That picture’s in the queue. Neighbor Bruce showed me where the nest is. He says he watched the adults going in and out while he was tending his maple sugaring operation, but hasn’t seen owlets yet. Yay, the joy of it, I can ‘feel’ your spring from here. Owls are so magical. Owls are magical. Fierce, too, of course – I understand the Great Horned Owl will eat snakes and skunks. (I think one tried to eat Miss Puss once, too, but it came off worse in the battle.) I remember very well a nature walk made when Rob the Firefighter was a toddler. It was advertised as an Owl Prowl, and we got to meet a rescued owl, hear an assortment of recorded calls, and then follow a ranger into the starry, snowy night to, er, prowl. It was wonderful. I discovered that owls do not flap, but glide silently out of nowhere to pounce on their prey. Astonishing. Beautiful photos again, Gerry! Your posts and pics are like an online nature course – love it! I am glad that you have been set free at last. Oh, I am glad too. I weep for joy every afternoon. Wait, wait . . . that may be the pollen allergies. The photos of the owl are wonderful. I’d not heard of trillium until I saw one on the wildflower blog of a fellow in Montana. They are so beautiful, and more widespread than I realized. But none down here, of course. Our Armand Bayou Nature Center has owl prowls once a month. If I bestirred myself, I could go to the next one. I still never have seen an owl. Hawks, yes, and waterbirds galore, but no owl. I need to do that. I encourage you to bestir yourself. Everyone should have the pleasure of seeing an owl, and of all people you would make the most of the experience. Wonderful photographic evidence that spring is a true phenomenon. Spotting the stray trillium in our backyard was an exciting spring event in the 1960s, especially after it was declared a protected species. Sort of like being introduced to royalty, whom you weren’t allowed to touch. This from the tortfeasing donkey-patter . . .
I’m glad you liked the photos. I’m pretty sure there is nothing quite so fine as a trillium in full bloom. Real spring is a joyously noisy time. Here the darn robins wake me up even earlier than the Princess does. But the question becomes . . . did they wake the Princess too? Thank goodness real spring has finally arrived. Funny, I just looked back at my own blog posts and found I posted this: http://karmardav.wordpress.com/2014/05/18/going-green/ on May 18. Must have been a good day! Love your wildflower photos. Thank you Karma – it was a very good day indeed.